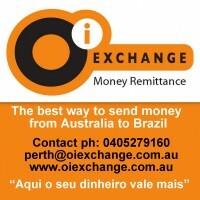 MONEY TRANSFER SERVICE between Australia and Brazil, Europe, Canada, Singapore and Dubai. Hello Bossa Nova Babies! We did it! Now it’s official! Thanks to you, supporters of my Pozible Crowd-funding campaign, and to the funding of the Department of Culture and the Arts of the Government of Western Australia , the Bossa Nova Baby Album is a reality. These are the incredible “angel supporters” of this Album – in Australia, Brazil, Italy, France, New Zealand, Qatar, Andorra, England, USA and Switzerland – so far! You are the first people to believe in this recording dream and to show that this project is credible and feasible. This list is just to acknowledge and celebrate your support! Thank you very much! Muito Obrigada! 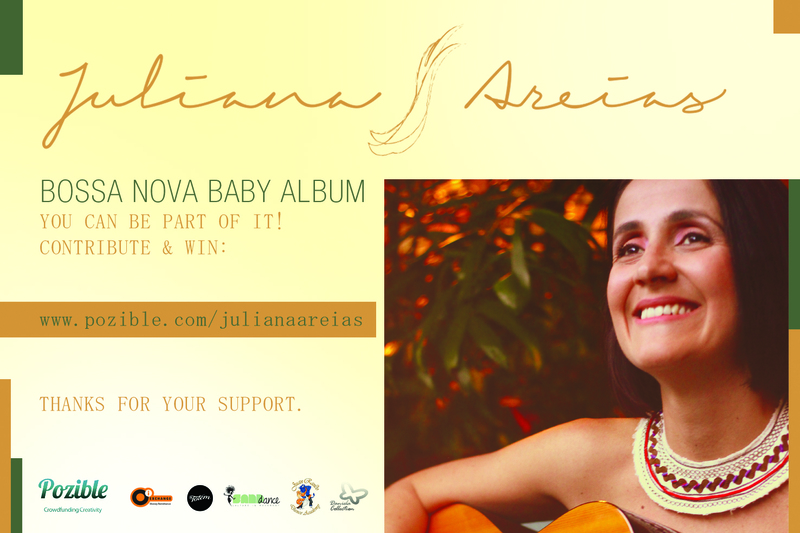 Thank you all for making the Bossa Nova Baby CD possible! Thanks to you, we have funded 50% of the total cost to produce the Bossa Nova Baby Album. Now we are working on the pre-production and arrangement of the songs. We have also applied for a grant. If it is approved, the project will count on the support of the Department of Culture and the Arts of WA! More news about the progress of the project and the winners of the rewards from all other sponsors – Totem Australia, Daniella Collection, SandDance and Juan Rando Dance Academy – coming soon. The month of May brings exciting news for you! Please find below full information about the Perth Jazz Society Sunday sessions at Laneway Lounge, including a presentation as part of The Perth International Jazz Festival on 11/5 – 6.30-8.30pm. Now it’s time to receive your rewards from the sponsors Totem Australia/Melko, Daniella Collection, SandDance and Juan Rando Dance Academy. 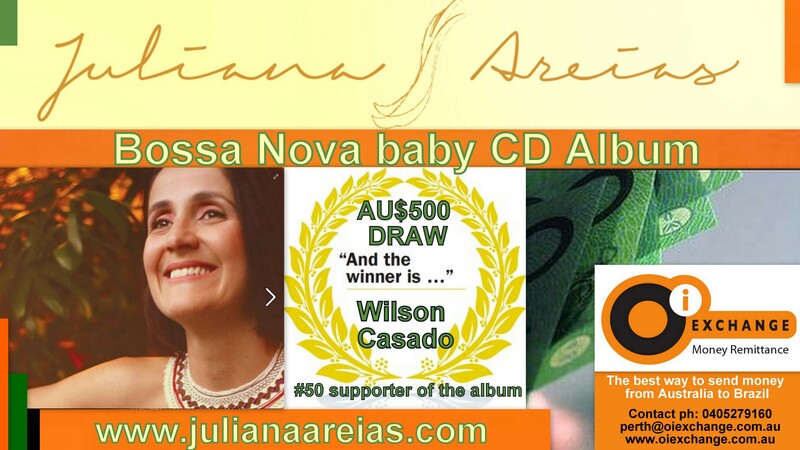 If you have contributed $50 or over for Juliana Areias’s new album Bossa Nova Baby, please go to Melko/Totem Online Shop and type the coupon discount code ”areias” on checkout to receive your $25 credit towards any Totem purchase with melko.com.au ( *Not cash redeemable. Valid for the month of May 2014 only. Worldwide Online Shop. Total number of winners: 82). Congratulation to Graca Cabral and Marilia Mendes , the winners of 2 exclusive free dresses by Melko/Totem Australia. If you have contributed $150 or over for Juliana Areias’s new album Bossa Nova Baby, please go to Daniela Collection Online Shop and type the discount code ”areias” on checkout to receive your 30% discount credit towards any purchase with danielacollection.com.au ( *Not cash redeemable. Valid for the month of May 2014 only. Worldwide Online Shop. Total number of winners: 21). Congratulations to Frederico Ramanzini, the winner of 1 exclusive free jewelry piece by Daniela Collection. Congratulations to Renata Martins, the winner of a “Samba no Pe” Class By SandDance. Congratulations to Terrence Loh, Geoffrey Drake-Brockman and Cynthia Zambelli, the winners of the 50% discount cards for a Private Latin Dance Class and of the Full Latin dance course for 6 weeks. Welcome to the Bossa Nova Baby CD campaign’s new sponsors METAX based in Brazil and PIZZA ZAMBELLI about to open in Perth soon! Thank you all again for your fundamental support ! More news about the progress of the project coming in the next few months! Stay tuned and see you around! Hi There! Thanks for checking out my crowd-funding campaign :-)I’m a Brazilian-born vocalist and songwriter based in Perth, Australia, and I am producing my first original album, titled; “Bossa Nova Baby”. The album is a celebration of over 15 years of performing and composing with superb musicians around the world, specially in Brazil, Switzerland, New Zealand and now Australia. My songs embrace the full spectrum of Brazilian music and its resonance with other musical styles such as jazz, funk, pop and rock. My album will explore how my authentic Bossa Nova accent has evolved over the years and has found influences in all the places I’ve been to and people I’ve met. The album will have 12 original tracks, all recorded in Perth with some of the most highly regarded jazz musicians in Australia. It has always been my dream to create this album with such quality standards and I am thankful that now I have the access, opportunity and maturity to draw all the necessary people and elements together to make it real. My mission with this project is to create a contemporary dialogue between Bossa Nova and all my other musical influences. My goal is to greet my audience with a type of music that goes beyond traditional boundaries and language barriers that can genuinely connect with people on higher levels of beauty, truth, love and life. If this “sounds good” to you, please support my campaign. And as thank you token also enjoy the fabulous rewards given by my amazing sponsors who have been collaborating with my career and believing in my music for years.Thank you for your support! * Pre-production costs ~ 5500 (Amount not added in the total cost of AU$ 35,000 but already spent to make the video, photo, flyer, printing, advertise, concert and music arrangements to launch this crowd-funding campaign. )To cover half of these production expenses, I am aiming to raise $17,500 from this crowd-funding campaign. For the other half I will be contributing with at least AU$ 7,500 from my own savings. I am also applying for a $10,000 government grant which will have its chances of approval doubled if this campaign is successful. As you can see, It is all or nothing. Your funds will only get drawn from you and released to my project if we meet this $17,500 target completely.Any extra money raised from this campaign will allow me to invest in the promotion of the album worldwide. This will help me to kick-start my Australian and overseas tours once the album is released. Would you like to come and watch my live perform in your city? THANK YOU for your generous contribution and for being part of my musical journey! It’s GREATLY appreciated! Veja em portuguêsA campanha aceita contribuições de todos os países e moedas e faz a conversão do dólar australiano para o real instantaneamente. Pozible é o website australiano melhor conceituado para campanhas desse estilo. As contribuições são processadas com segurança por cartão de crédito ou sistema Pay-Pal. Os prêmios também serão entregues em qualquer lugar do mundo sem nenhum custo adicional. Qualquer dúvida ou se precisar de ajuda para acessar o website, por favor, fale comigo ( juliana@julianaareias.com ).Somente com a sua contribuição o CD Bossa Nova Baby poderá ser produzido. A campanha tem um prazo limitado para progredir e ser bem sucedida. As contribuições feitas serão processadas somente se a campanha atingir a sua meta total no final do prazo determinado. Ou seja, voce faz sua contribuição agora, mas o seu cartao será debitado somente no dia 31 de marco. Por isso, se você pode contribuir com esse projeto, é importante que o faça rapidamente. Por favor, contribua agora e faça parte dessa viagem musical comigo, apoiando o crescimento da arte e cultura brasileira mundialmente.Além de ganhar o álbum em formato digital ou CD; com quanto mais você puder contribuir, mais gratificações você vai ganhar. Você pode ganhar outros prêmios dos meus patrocinadores, incluindo , 4 vestidos daTotem, grife brasileira internacional, 10 colares da Daniela Collection, uma entrada para participar do sorteio de 500 dolares australianos feito pela Oi Exchange, aulas de dança e muito mais. Você pode ainda ser destacado como co-produtor do CD e ter uma das canções do CD dedicada a você ou a alguém que você ama.A campanha também apresenta um pacote para empresas interessadas em se tornarem meus patrocinadoras oficiais por um ano, com exclusividades tais como, exposição da sua logomarca no meu website e minhas paginas virtuais, um show ao vivo para a empresa, copias do CD como brindes para seus clientes e claro o status de ser uma empresa que apoia arte e cultura brasileira mundialmente.Super obrigada pela sua ajuda tão essencial!Beijos cheios de bossa,Juliana Areias :)”Lá, é meu lugar. Melhor que qualquer lugar. Coração.” ( Juliana Areias – canção “Meu Lugar”). Perth, Western AustraliaMessageSupported 1 ProjectsFacebook linked as Juliana Areias with 2458 friends. With over a year of consecutive sold out concerts around Australia, Brazilian Singer Juliana Areias, based in Perth since 2009 is already a reference in the local music scene and abroad. Juliana was personally introduced to the Bossa Nova founders when she was a teenager by legendary Brazilian Music historian and journalist Ruy Castro who also named her “The Bossa Nova Baby”. This direct learning and unique experience have inspired her to become a professional singer. Juliana Areias has lived for many years in Europe (Switzerland) and New Zealand prior to moving to Australia. Always working in the music circuit, her career includes performances at major international festivals such as the revered Montreux Jazz Festival, Auckland Festival, and American’s Cup (NZ). Most recent 2013 performances include the Inaugural Perth International Jazz Festival, New York’s exhibition “Van Gogh, Dali and Beyong” at The Art Gallery of Western Australia, and Ritmo Festival at The Darling Harbour, performing for over 30.000 people. Juliana Areias has recorded for the poet, composer and Brazilian diplomat Marcio Catunda, 6 of his albums produced respectively in Switzerland (Anima Lirica -1997), Bulgaria (Crescente – 2000), Brazil ( Mistica Beleza – 2003/ Itinerario Sentimental – 2008) , Spain (Agua de Flores – 2009) and Portugal (O Jardineiro da Vida – 2010). .
Juliana Areias music embraces several shades of the Brazilian music spectrum and its resonance upon jazz and other international musical styles. Her authentic Brazilian voice, sense of groove, engaging charisma and a very personal and passionate stage presence are the trademarks of her work.